The Pacific War Online Encyclopedia: Smith, Julian C.
Table of Contents Next: Smith, Oliver P.
Julian Smith was born in Maryland and graduated from the University of Delaware in 1909. He was commissioned in the Marine Corps and participated in the Vera Cruz occupation. He graduated from the Command and General Staff School in 1928 and served in Nicaragua, where he injected a new sense of initiative into his command, before being promoted to brigadier general and sent as a naval observer to London in 1938-1941. "General Julian" was promoted to major general in 1942 and was given command of 2 Marine Division on 1 May 1943. He led the division at the bloody battle of Tarawa. He subsequently became commander of the Pacific department of the Fleet Marine Force and commanding general of Parris Island Marine Base before retiring as a lieutenant general in 1946. Smith gave those who did not know him well the impression of being a gentle, dreamy man who, when he smiled, exuded warmth from his whole person. This impression was deceiving. 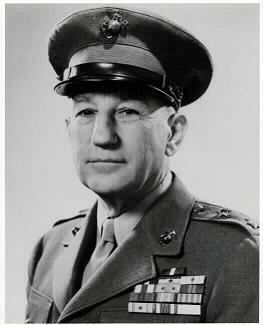 Smith was a capable Marine general who could impose iron discipline when the situation called for it, as it did at times in the Tarawa operation. However, his concern for his men was genuine, as was his unassuming manner. He was a superb planner and inspiring leader.